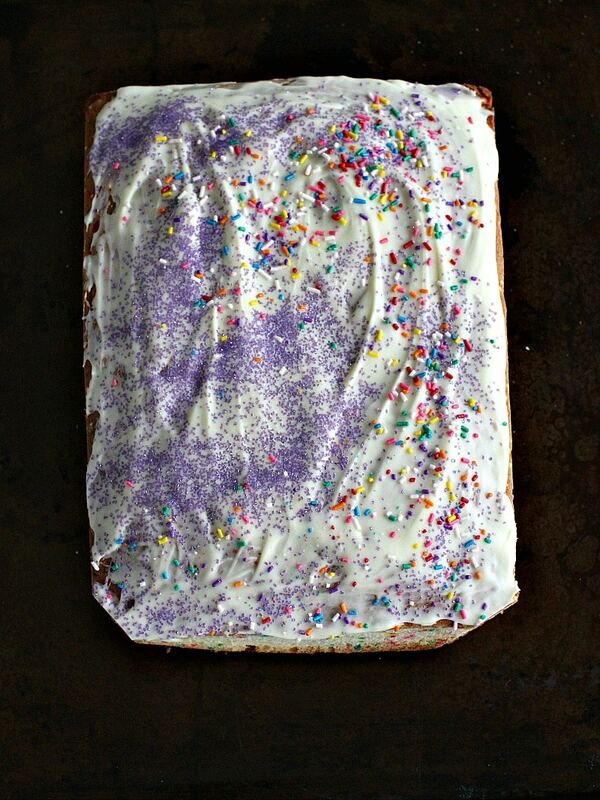 White Chocolate Funfetti Cake is very easy to make with just a few ingredients. 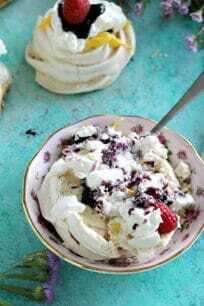 It is loaded with sprinkles and topped with melted white chocolate, making it a fun and tasty dessert. 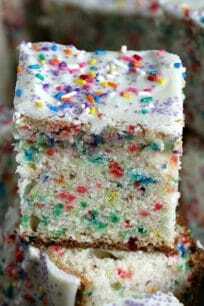 This Funfetti Cake is so pretty and tasty, that is perfect for themed parties, and is a hit with kids and adults alike! I love making cool and easy cakes, like my other popular once Purple Cake, Raspberry Angel Food Cake and Triple Chocolate Pound Cake. 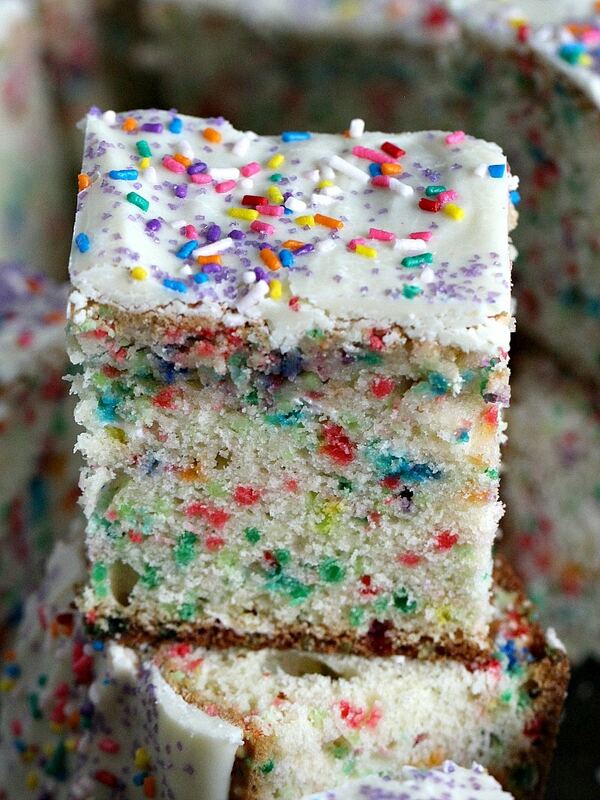 This White Chocolate Funfetti Cake is covered in white chocolate, and is perfectly fluffy and sweet. This cake is fun to make, and a great kitchen project with kids. 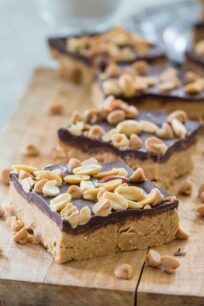 This cake is very easy to make, mix, bake and enjoy. The batter for this Funfetti Cake is very versatile, you can easily use it to make cupcakes, or a layered funfetti cake. The toppings are again based on preference. I I made the cake with the intention to send it to my son’s pre-school, so I covered it in white chocolate and sprinkles, since its easier to transport. However, you can mix things up if desired. Also, its much easier for kids to eat, and should I add, mess free. My son absolutely loves it when I give him treats to take to school, and he is super excited to share this chocolate covered cake with his friends and teachers. 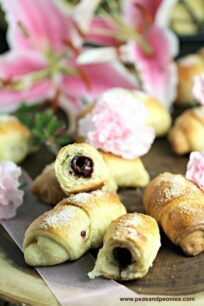 First of all, it is very easy to make and requires only few ingredients. Also, it is great to make together with kids! Easily transportable for party or events. Using funfetti cake mix is best because it ads a lot of flavor. However, you can also use yellow cake mix if you don’t have funfetti cake mix on hand. Just add more sprinkles to the batter. The unsalted butter must be room temperature. So try not having greasy and oily, as at that point the butter is way too melted. Adding extra sprinkles to the batter is optional, but why not load it with sprinkles. Be careful when melting the white chocolate as it tends to separate, start by melting for 30 secs and stir well. The sprinkles are made of sugar, corn syrup, cornstarch, little food-grade wax, and artificial coloring and flavoring. How to Freeze this Cake? The cake can be easily frozen. Cool the funfetti cake completely. Fully wrap it in plastic wrap tightly. Next, wrap in aluminum foil or place it in freezer bags. Freeze for up to 3 months. Defrost before slicing. Line an 11-by-8-inch baking pan with aluminum foil, spray with cooking spray; set aside. Using a mixer, cream together butter and sugar until fluffy, or for about 3 minutes. On low speed, add eggs one at a time, add vanilla extract and beat until combined, making sure to scrape the sides of the bowl with a spatula. Combine flour, baking powder and salt in a bowl. Add half of the dry ingredients to the wet ingredients, mixing until just combined, add the milk and once combined, add remaining dry ingredients. 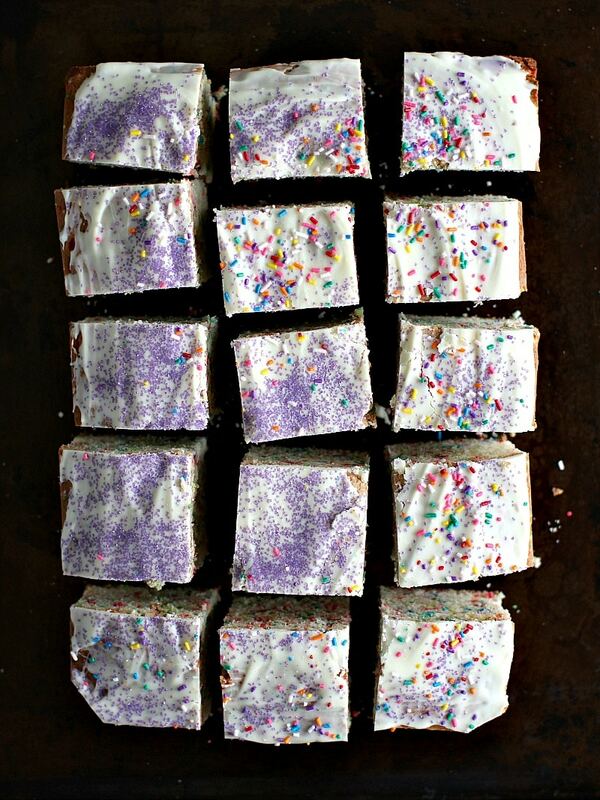 Using a spatula, fold in assorted sprinkles. Pour into prepared pan and and bake for 50 - 60 minutes, or until a cake tester inserted into the middle of the cake comes out clean. Half time into baking, rotate the pan, to make sure the cake bakes uniformly. Let the cake cool into the pan for 10-15 minutes, before transferring to onto a wire rack. Let the cake completely cool before topping with white chocolate. Let the cake cool completely before drizzling with white chocolate. Bring a medium saucepan half filled with water to a boil. Place white chocolate in a medium bowl set over the saucepan of simmering water, let it melt, stirring just a few times. Make sure the bowl doesn't touch the boiling water, to avoid overheating. Remove bowl from heat and pour the white chocolate over the cake, top with sprinkles. Let stand for 15-20 minutes before serving for the chocolate to settle, or better place cake in the fridge for 10 minutes for the chocolate to harden quicker. So festive and pretty…love this!